BONN, Germany — A White House roundtable on fossil fuels and nuclear energy became an outlet for international rage at President Trump, who has disdained the world’s work to contain climate change. Yesterday’s event, hosted by White House energy adviser George David Banks, didn’t offer the same level of defiance shown by Trump in June when he accused the world of “laughing at us as a country” for joining the Paris Agreement. Instead, it promoted efficient energy use as a main tool to combat global warming, a message that struck attendees of the U.N. climate talks as a sign of the United States’ weakened commitment to combat rising temperatures. Climate advocates here weren’t having it. Days earlier, foreign delegations and visiting U.S. Democrats criticized the White House exercise as an assault on the work being done by 196 other countries committed to staying in the Paris accord. Banks sought to soothe that frustration yesterday by promising that the United States would play a constructive role in Paris negotiations, even though it’s on track to withdraw from the pact in 2020. He said it’s possible that the United States could remain a member if more favorable terms could be “identified,” and he pledged to make himself available all week to international delegates and press. “We’re happy to sit down with anyone and discuss climate policy and the politics of climate back home and globally,” Banks said. An hour before the event began, a line of young environmental advocates trying to get in, hoping to participate in a planned protest, stretched across the length of the convention center hall. Govs. 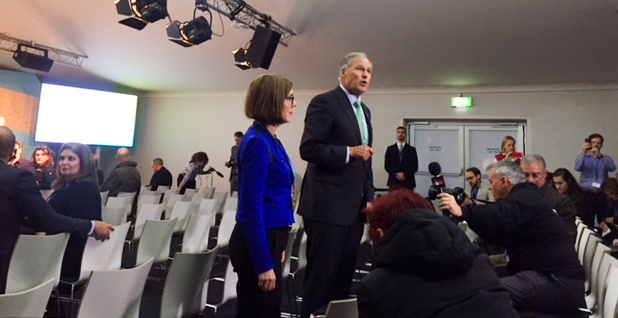 Jay Inslee of Washington and Kate Brown of Oregon, attending as part of a pro-Paris delegation of Democratic governors, appeared in the room to offer a pre-emptive rebuttal to waiting reporters. Inslee compared climate solutions from fossil fuel advocates to arsonists counseling fire departments on firefighting. Trump, who has been on a tour of Asia and has yet to comment on the U.N. climate gathering, was the target. “He can tweet his fingers off, but he cannot stop us,” said Inslee, touting his state’s carbon regime as a hedge against Trump’s policies favoring fossil fuels. Inslee hopes to pass a statewide carbon price. “So you claim to be an American, but we see right through your greed. It’s killing all across the world for that coal money,” they sang. “We chose the patriotic tune because part of what ‘we the people’ are doing here at the [Conference of the Parties] is telling the true story of America leadership taking on climate change and working to protect our communities,” said organizer Dyanna Jaye.